The only deaf person in his family, Leon Lim is also the only artist. A native of Alor Setah, Kedah, Malaysia, he attended several schools for the deaf, but wanted a school where the teachers had advanced sign-language skills, and enrolled in the venerable English-language Federation School for the Deaf in Penang (several states away), the nation's oldest such school; it had been founded by the British in 1954, three years before Malaysia became an independent nation. He insisted on living on his own. After graduating from FSD, he attended the Equator Academy of Art and Design, also in Penang, then enrolled at NTID/RIT, where he majored in Interior Design and minored in Photography. He thrived, and graduated in 2004. It's difficult to categorize Lim as an artist, since he has worked in a variety of media, and his subjects range from traditional portraits to street art to 3-D installations. Some of his work is playful, some satirical. His newest sculptural installation, 3(656), consists of three panels beautifully crafted of a variety of woods, giving a multi-hued effect, with Plexiglas-encased lights interspersed among the "bars" of wood—a bit like accordion-folded vertical blinds, but with a magical quality. He was one of eight artists represented in VSA Arts' Renascence/07 juried multimedia exhibition at the Kennedy Center's Terrace Gallery last June. His 4-part multimedia sequence, "Silent Story," included "Killing My Deafness," a harrowing self-portrait besieged by disembodied, discolored hands, probing, poling, ripping open, and puncturing his throat, mouth, cheek, and ear—a savage comment on traditional Asian-style shamanistic medicine, but which can also be read as an indictment of Western-style interventionist treatment of deaf patients. Deaf people whose families refused to accept them as they were can readily identify with Lim's agonized and unwilling deaf patient. "I've been living with my deafness since birth," Lim said in a video interview before the show opened. "I've never experienced any sound or music." 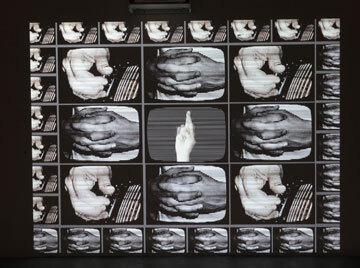 Three video panels in "Silent Story" confront viewers with the experience of miscommunication. "Missing Message: Deafness" is a video bank of repeated and duplicated videoclips of speaking or singing mouths (including a dolphin's snout)—all with the upper portion of the face cropped, making it virtually impossible for viewers to speechread them. The center "screen" shows stills Lim's own mouth, relaxed, peaceful, not jabbering any unreadable messages. "Missing Message: Hearingness" (left) is similarly organized, but shows stills of hands in various attitudes. In the center "screen," a hand fingerspells "DO YOU UNDERSTAND WHAT I SAID?" far too fast for readers to comprehend. He notes that many of them said, "I can't understand what you said!" or "Hey, I can't understand what he fingerspelled!" Lim appreciates the irony. The last screen, "Bring All People to Reunion Like Rose" incorporates the same loops and stills seen in "Missing Messages," but rearranged in a video-mosaic image of a blossoming rose—harmony and completeness. He works as a graphic/Web designer and photographer for OGI, the upscale fashion-accessory company; his spare time is devoted to freelancing. New projects and shows are coming up: a 2009 calendar project with the New York City Mayor's Office, an invitation from the Total Museum of Contemporary Arts in Seoul, Korea, the summer, a photographic exhibition at a top Malaysian gallery. "The world need good leaders," he says. 'The art world needs passionate artists." As his reputation grows, he'll be busier flying between continents—and bridging communities.